EDUCATION Page 28 T IS FOR TENSION. Be sure to obey manufacturer guidelines regarding installation and long-term tensions to apply to a cable. Manufacturers specify these guidelines to limit the strain applied to the fibers inside a cable, which is what helps provide long-term reliability. A tension meter can help determine the tension, or for the best results, use a breakaway swivel rated for the fiber you are pulling. A IS FOR ABRASION. All cables have some type of outer sheath protecting the fiber. It's important not to abrade or otherwise damage this outer sheath. If the sheath is damaged, a layer of protection is compromised and can lead to potential problems, especially in outdoor applications. If a cable's sheath is damaged, use an appropriate material to provide a long-term patch or consider replacing the cable. C IS FOR CRUSH. Fiber optic cables are designed and manufactured to withstand typical crushing forces expected during the installation process. However, if they're exposed to crush forces beyond what is typical, the fibers can get damaged. So make sure that cables are properly protected from crush forces by making sure they're not stepped on or driven on, depending on the application, and always respect the minimum bend radius/diameter specified by the manufacturer. Also be sure to use pulleys of the appropriate size if they're needed for the installation. T IS FOR TWIST. The above-mentioned breakaway swivel can help reduce twist during the installation. Cables are designed to withstand typical amounts of twisting, but make sure that they're not twisted more than the cable can withstand. When in doubt, ask. Following the above will increase your chances of success regardless of the type of fiber cable installation you're doing. 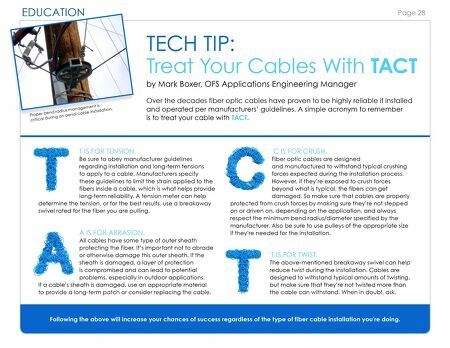 TECH TIP: Treat Your Cables With TACT by Mark Boxer, OFS Applications Engineering Manager Over the decades fiber optic cables have proven to be highly reliable if installed and operated per manufacturers' guidelines. A simple acronym to remember is to treat your cable with TACT. Proper bend radius management is critical during an aerial cable installation.